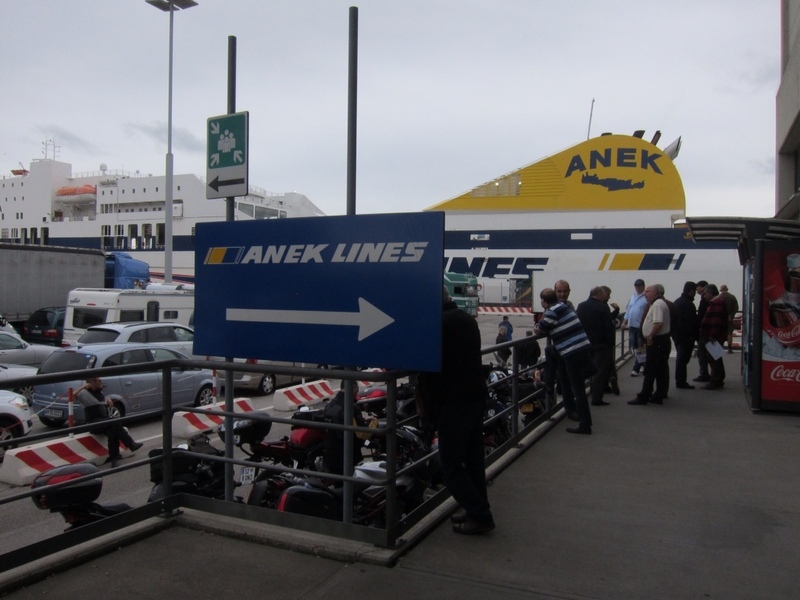 Monday 3rd June, aboard the Anek Lines ship 'Forza' , somewhere in the Adriatic, en-route to Patras,Greece. 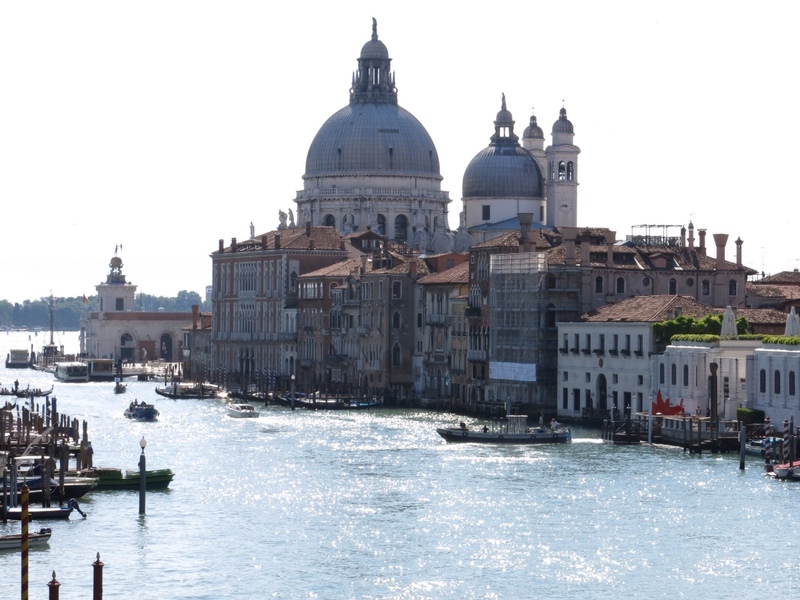 After two nights in Venice, ( and YM has at last had her long-held wish come true…. 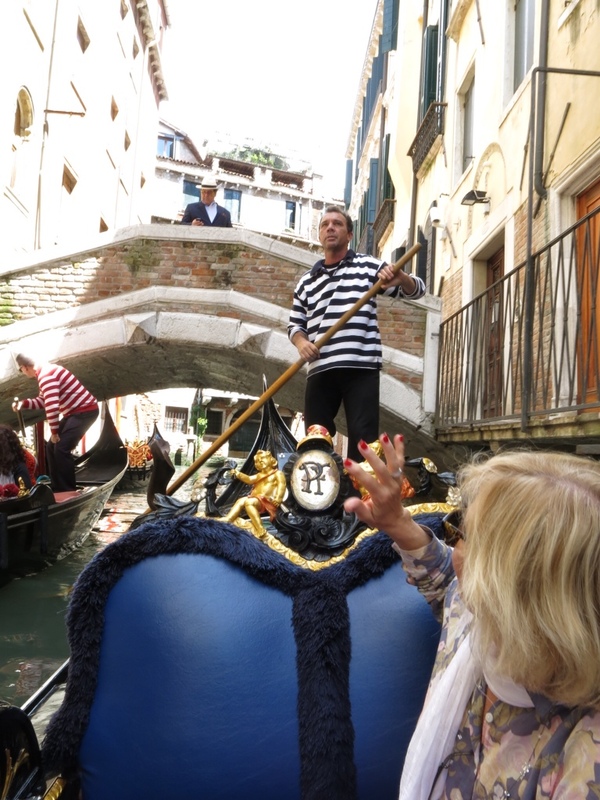 a gondola ride with a handsome lover…. OK, maybe she didn't get exactly what she wished for, but a ride is a ride!) staying at the 'Taverna San Lio' near to Ponte Rialto, we checked out at 9:30am and noisily made our way to the vaperetto stop at Rialto. In Venice, the most common sound you hear, at all times of the day and night, is that of suitcases with wheels, being dragged along the cobbled/paved streets. The problem happens when you have to cross one of the numerous bridges, and pick up/schlep your luggage up and down the steps. YM had her own method of doing this, just dragging it up and dragging it down…bang bang bang bang….I hope her wheels don't fall off with the extreme rough treatment. 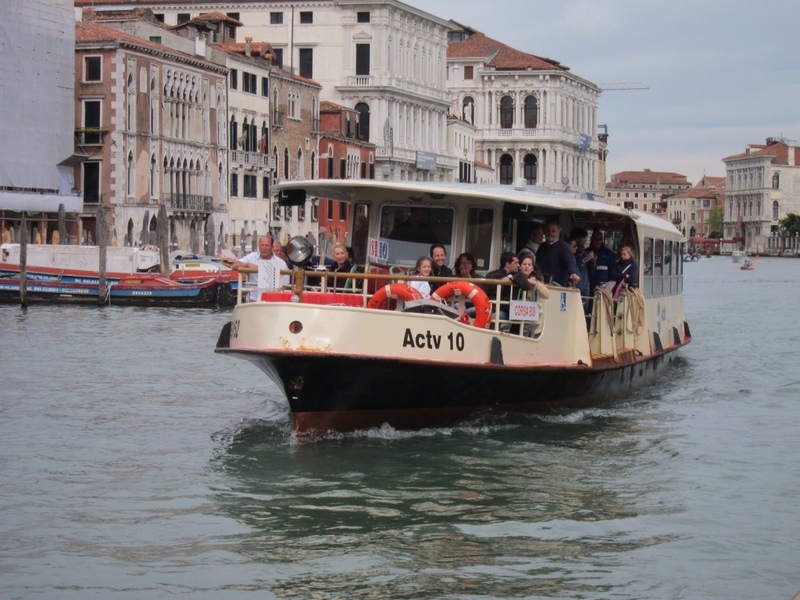 The vaperetto took us northwards along the Grand Canal, towards the Ferrovia Railway station. Our stop was the next one, Plaza de Roma. 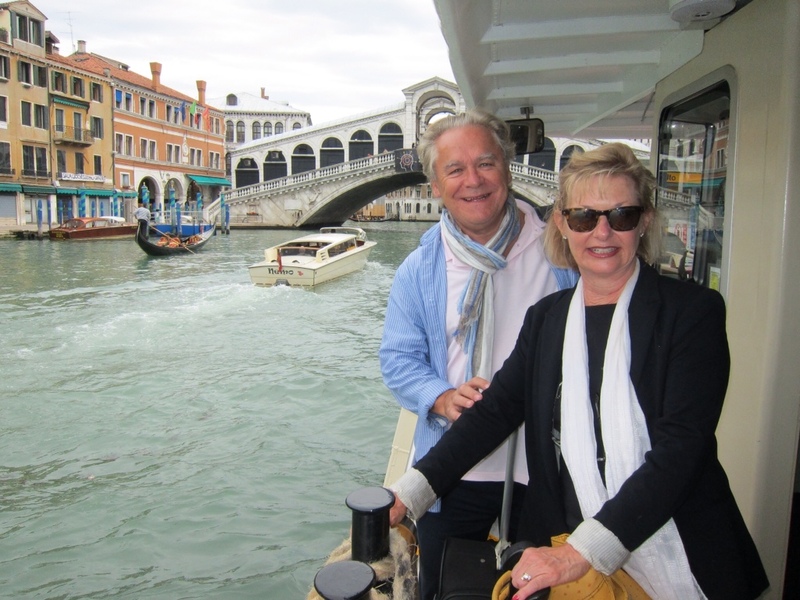 We fought our way off the crowded vapo, and walked the 300 metres to the new 'PeopleMover', a monorail that connects old Venice with the port and the new Cruise Terminal. At the ticket machine ( one euro each) YM stopped to help two elderly ladies from Belgium obtain tickets etc…. and her good deed was nearly her undoing, as one of them knocked over her bag, which contained a couple of bottles of wine….I heard a nasty 'crack' as the bag hit the ground…luckily the vino was intact…phew. No sooner had we got our tickets, we then had to use them to access the facility, through those automatic doors…. these were NOT designed for people with multiple pieces of luggage, as no sooner had I put the ticket in the slot, the doors opened, I turned to pick up my luggage, and they promptly shut again, with me on the wrong side of them. I tried putting the ticket in again, but auto-machine was not having a bar of it… only thing left to do, without buying another ticket, was to push my luggage thru underneath, then get down on my hand and knees and crawl through the gap tween floor and gates. Not at all a cool look….but I was not the only one doing this hand/knee shuffle, most people with luggage, including the Belgium ladies, had to go thru the same routine. YM had no such problem though, she could quite easily squeeze thru the gap between gates!!! After negotiating the gates, we caught the lift up to the 'People-Mover' platform, waited 7 minutes for the monorail to arrive, got on, and less than 200 metres , and about 30 seconds later, we had arrived! What was that all about. After catching the lift back down to ground level, we followed the signs to the port. We were in for a long walk, as we could see out ship quite a long way in the distance, right at the end of the wharf . just then, YM spotted some workers moving hand trolleys around, and had soon sweet-talked them into releasing one for us. Without any signage to guide us in the right direction, we found ourselves on the part of the wharf where the trucks from the ferry were being both unloaded and jostling for position to be unloaded. We were seriously in danger of being run over by any one of dozens of huge articulated trans-continental trucks!!! After dodging and weaving our way around them, we found ourselves at the Gate to the terminal, only to be told by the officious guard on duty that we couldn't enter this way, it was the exit only, and we needed to go back to the entrance gate, 300 metres back from where we'd been. 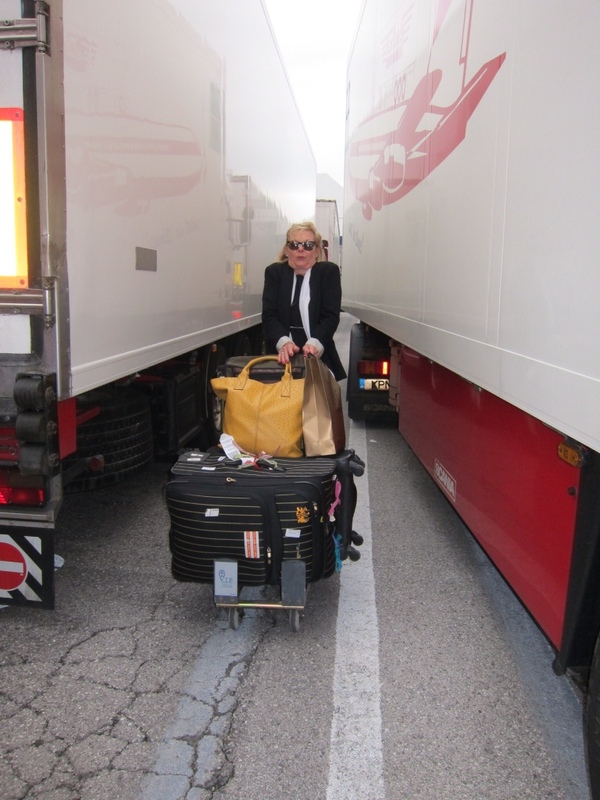 So… of we went again, this time negotiating our way thru the Maze of trucks waiting to get onto the ferry. We did have to laugh though as we could see the funny side of it. 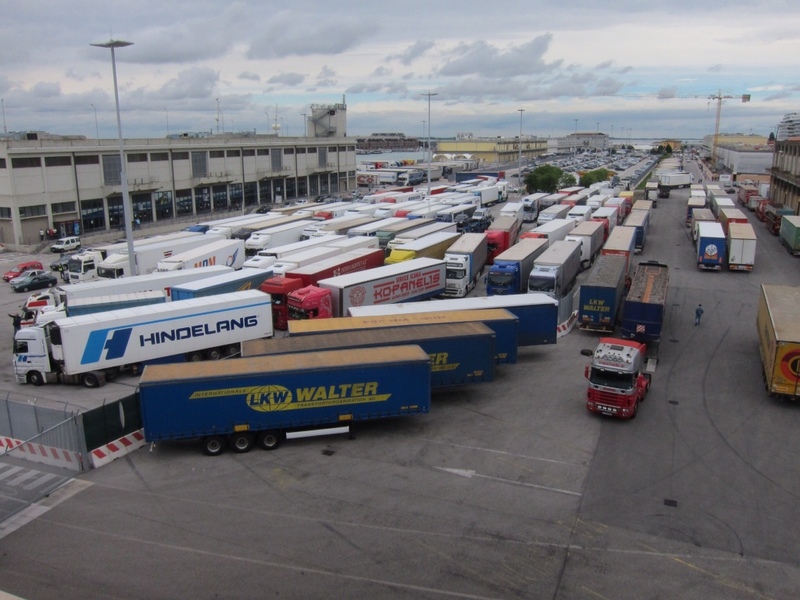 When we eventually arrived at the correct Terminal ( by the way, nowhere near the directions given on our ticket), we were told we wouldn't be able to board right away, we'd have to wait for the ship to fully unload all the incoming cars and trucks first. Time to crack open a beer, even if it was only 10:45 am… When we did embark, about 11:45, we realised that no way would the ship be sailing on time as scheduled for 12 noon. AT LAST the sun is shining… woke up at 9am by announcement over the tannoy system that breakfast was to finish in 30 minutes… pulled up the blinds, and looked out at a flat calm blue sea and a sunny blue sky…. summer is here at last…. this is more like it! 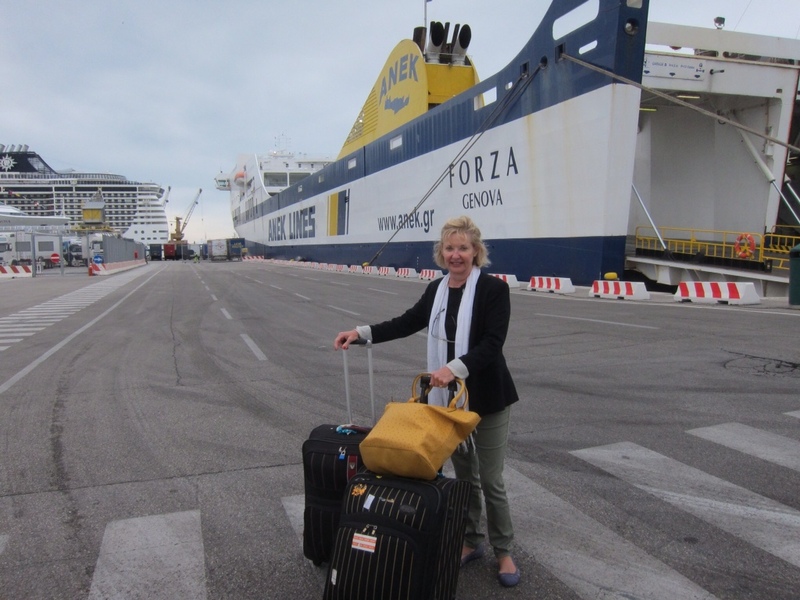 It's now 4:30 in the afternoon, and we are just pulling in to our first, and only stop, at Igoumenitsa, a port town on the west coast of Greece, opposite Corfu. 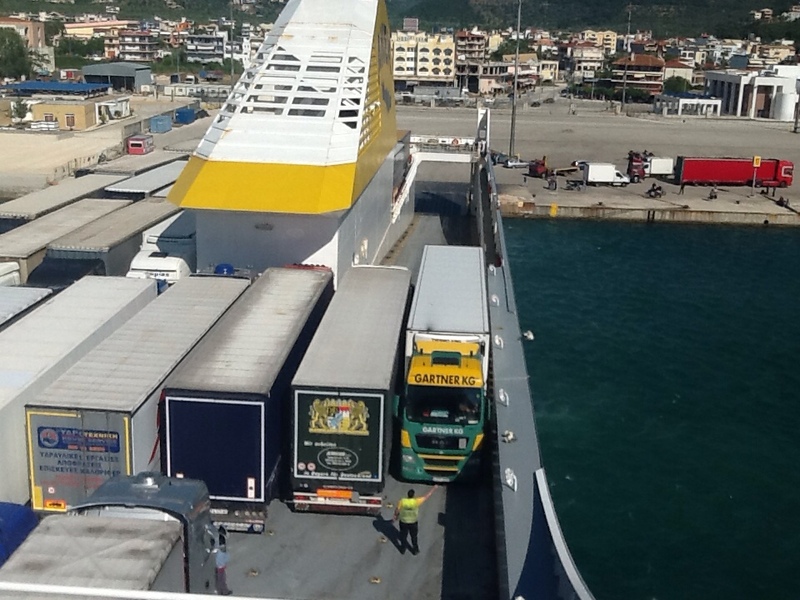 We are still about an hour late, and are now rescheduled to arrive at our destination in Patras at 11:30 pm…. this is Greece…expect some time after midnight. Mum – your green pants look great! Dad – love the scarf!! I would love to go with you guys on a slow boat to Patras!!! So….enjoying the Blog, well done once again tomtom, if we can not be there, this is second best!!!!!!!!!!!!!!!!!! 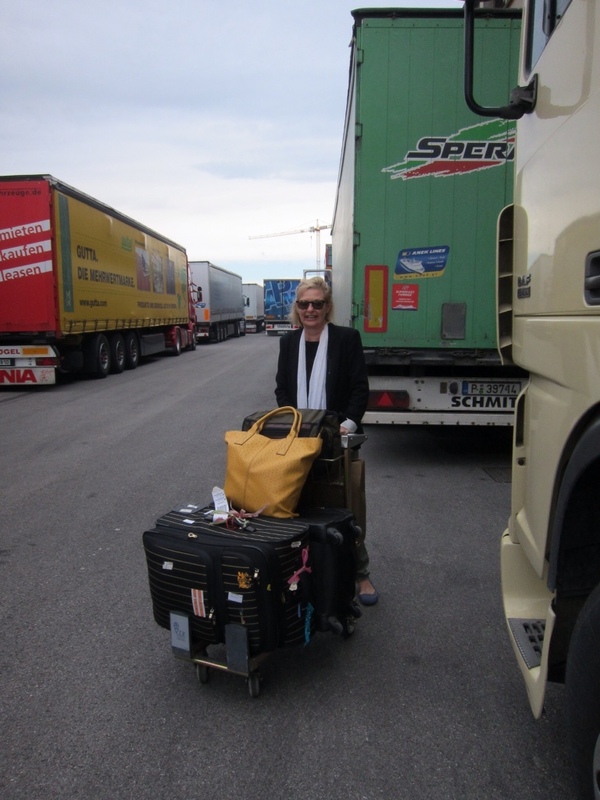 Heheheh love the photo of our gorgeous little YM surrounded by those BIG transporters!!!!! She WON!!!! Have a FANTASTIC day/night TT, I know YM will make it very special, Yineka-mou style Fun, fun fun!!!!! !